Marie Antoinette was never to become fond of Fontainebleau – it was enormous and sprawling, its stately edifice and richly painted interiors a reminder of its heyday in the sixteenth century when it had been the prefered residence of the Valois kings. 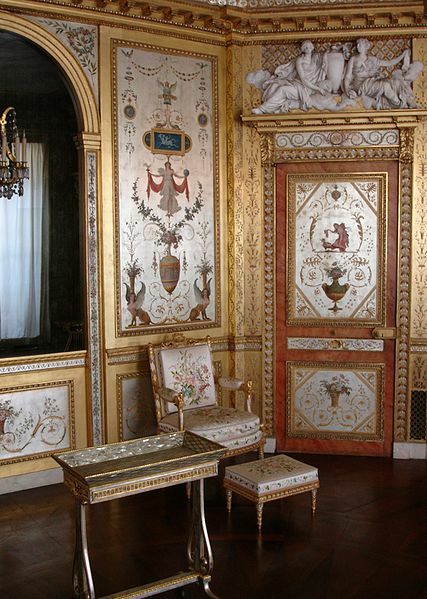 There is something barbaric about Fontainebleau, with its dedication to the hunt and its rich, Renaissance interiors that would almost certainly have been extremely unappealing to Marie Antoinette, who felt isolated and desperately bored in her vast state apartment. In an attempt to placate his occasionally petulant wife, Louis encouraged her to commission two exquisite rooms to either side of her state bedchamber – the salle de jeu and, hidden behind her enormous bed, the beautiful boudoir with its shimmering mother of pearl walls and sumptuous furniture, studded like fish scales with mother of pearl. To read the entire article, and look at the beautiful photos, click here.